In retrospect, one of the worst things about my teenagehood was that there was no video game with a soundtrack composed by the bassist from Celtic Frost. Oh, to live one’s formative years in the 2010s, at a time when dark metal pioneers are happily collaborating with the video game industry! There’s probably more to Slain! than its soundtrack, of course – it’s a gruesome 16-bit style action-platformer – but we won’t know for sure until March, which is when it’s now scheduled to release. Originally slated for a “fall 2015” release (spring in Australia), Slain! is now scheduled to release on March 24. 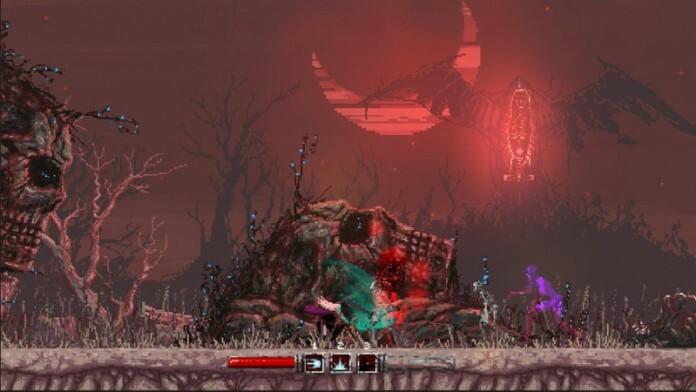 “The game needs a few last tweaks because right now no mortal man or woman could possibly get past Slain!’s intense platforming, traps and monstrosities,” studio Wolf Brew Games wrote.